Skyros Designs Cantaria Caramel Rectangular Serving Tray. 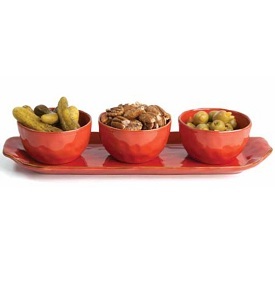 Skyros Designs Cantariafine, thin stoneware has excellent durability without heaviness. Cantaria organic shapes, rich texturing, soft contours and beautiful colors are enhanced by an elegant sheen. Cantaria Rectangular Serving Tray in Caramel color. This tray holds 3 ramekins (sold separately and as shown in large picture) to create a dip/sauce serving set. Hand-rubbed patina accent on beautiful warm taupe caramel to accent your kitchen. Caramel color complements Red, Ivory and Pine colors. Tray handcrafted in Portugal of chip resistant light-weight stoneware that is dishwasher and microwave safe. Serving tray from Skyros Designs collections of dinnerware, serveware, bakeware, table setting and culinary kitchen accessories.